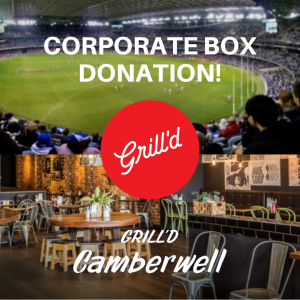 Thanks to the generosity of Grill’d Burgers in Camberwell, Canterbury Football Club is the grateful recipient of a corporate hospitality suite for 14 people at the St Kilda vs West Coast game this year. This is significant for a local community organisation like Canterbury Football Club as it plays a meaningful role in offering something of material value back to our players, volunteers, and supporters. Grill’d has a proud tradition of actively supporting local community groups. Since launching the Local Matters community program in 2011, Grill’d has raised over $4,000,000 for more than 20,000 local community groups across Australia. Get along to Grill’d Camberwell (879 Burke Rd) and enjoy a quality burger. Make sure to pass on a ’thanks’ to the team at Grill’d when you are down there next. Their support is greatly appreciated by all members of the Canterbury Football Club community.